The famous watch company Zenith has announced a new limited edition model El Primero Chronomaster Power Reserve - Terra, equipped with a brown dial Sunray, reminiscent of the vast expanses of Asia and Europe. The watch will be on sale only in Central and Eastern Europe. The aperture, placed on an elegant dial, allows keeping track a unique mechanism El Primero 4021 with the chronograph function. The watch caliber construction is redesigned: the balance is shifted to the edge of the mechanism at the 10 o’clock position. The mechanism, consisting of 242 components, has a balance frequency of 36,000 pc / h, counting down tenths of a second, and a 50-hour power reserve. The novelty is dressed in stainless steel. Waterproof to 100 meters, the case has a diameter of 42 mm. The crown and pushers and are made of 18-carat pink gold. The El Primero Chronomaster Power Reserve Terra watch comes on a brown alligator strap. To buy the El Primero Chronomaster Power Reserve Terra Special Edition watch is available through the official representatives of Zenith. Swiss watchmaker Zenith has released the novelty Pilot Type 20 Grand Feu with Sapphire Case, which will be officially presented at the annual exhibition BaselWorld 2014. Famous watch company Zenith has announced its new ambassador. It is an American professional basketball player, who plays for the NBA team "Oklahoma City Thunder" Russell Westbrook. The company Zenith will be the official timekeeper of the regatta 52 Super Series for the next three years. February 10, the company Zenith has sponsored the "star" event The Hollywood Reporter, organized in honor of nominees for the 86th annual Academy Awards in Beverly Hills. The new Pilot Montre d'Aéronef Type 20 GMT 1903 timepiece by the Swiss watchmaker Zenith is presented in a round titanium case with DLC coating, with a diameter of 48 mm and a thickness of 15.8 mm. Water-resistant - 100 meters. The watch brand Zenith presents a novelty El Primero 410 Triple Calendar and Moon Phase, made in a classic, elegant style. The watch company Zenith presents its novelty Pilot Montre d'Aéronef Type 20 (Ref. 18.2420.5011/21.C723), released in a limited edition of 75 items. The new Pilot Montre d`Aéronef Type 20 GMT Tribute to Aviazione Navale watch by the watch company Zenith is dedicated to the Italian naval aviation - Aviazione Navale. The company Zenith has released a limited edition model El Primero 410 Limited Edition Calendar Chronograph. The novelty is made in the image of a rare vintage model El Primero 1970 and has all the features of the previous model. In 2004, the companies Zenith and Dior began to develop the first joint caliber Irréductible for the models from the Chiffre Rouge I01 collection. In the current year as a result of joint efforts, the collection of caliber is supplemented by two innovations Irréductible and Elite. Swiss watch manufacturer Zenith has released a limited edition watch Christophe Colombe Hurricane Grand Voyage, dedicated to Christopher Columbus and his great swimming in 1492 to the shores of the American continent. The watch company Zenith presents a special lightweight racing version of the model El Primero Striking 10th. Located in the heart of Geneva, the boutique of the famous watch brand Zenith was robbed. According to local media, the criminals broke into the store and took 30 watches to storefronts. The watch brand Zenith has introduced a new model El Primero Stratos Flyback Rainbow, released in a limited quantity of 250 items. The watch brand Zenith has announced the release of a new model El Primero Chronomaster, released especially for the English boutique Watch Gallery. An ambassador of the watch company Zenith since 2011, the young athlete Martin Fuchs won the Mercedes cup, held in the context of the international tournament CSI *** Ascona. The watch manufacture Zenith has announced the release of a novelty Pilot Montre d'Aéronef 40MM Lady. The design of the new model Heritage Star of the Swiss watch company Zenith is made in vintage style. After the concert, the American rock band Kiss, which took place at the stadium in Zurich Hallen, the known watchmaker Zenith has invited to its historical manufactory the famous Kiss drummer Eric Singer, the world-famous producer Doc Mcghee), also a producer Bon Jovi, a rock band Scorpions, and the tour manager Paco Zimmer. Especially for a charity auction Only Watch 2013, the famous watch company Zenith has developed a new watch Patrimony Felix Baumgartner Stratos Prototype 1 - a prototype designed to Austrian skydiver Felix Baumgartner. This year, the legendary watchmaker Zenith, a partner of the exhibition BaselWorld from its founding, has celebrated the 90th anniversary of its participation. At the annual exhibition of watches and jewelry BaselWorld 2013, the Swiss watch brand Zenith has introduced a new model Pilot Montre d'Aéronef Type 20 Tourbillon. The famous watch brand Zenith has released a novelty Pilot Montre d'Aéronef Type 20 Annual Calendar in two versions: a titanium case and bezel, crown and buttons made of 18 carat rose gold (Ref. 87.2430.4054/21.C721) or in a case of stainless steel (Ref. 03.2430.4054/21.C721). Swiss watch brand Zenith has announced the release of its next novelty - El Primero Tourbillon Chronograph. The original model is characterized by an innovative round date display, which is located around minute tourbillon carriage in a round aperture at 11 o’clock position. The watch company Zenith has sponsored The Hollywood Reporter's Night 2013, dedicated to the main nominees of film awards "Oscar". The company Zenith together with the Musée International d'Horlogerie (MIH) has created a special version of the Captain Winsor Annual Calendar Boutique Edition watch. 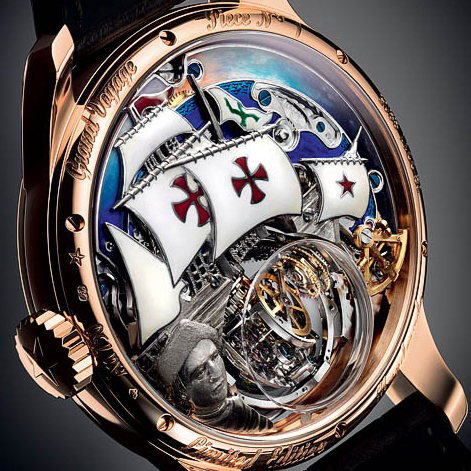 The legendary watch brand Zenith has released a new limited edition watch Academy Christophe Colomb Hurricane (Réf. 18.2210.8805/01.C713), which will be officially presented at the international annual exhibition of jewelry and watches BaselWorld 2013. It is recently announced that the former president of Zenith, Thierry Nataf, who left it in 2009, returned to the watch industry. Now he will lead the company HD3 Slyde, founded by Joerg Haysek. The watch manufacture Zenith building was built in 1905. In August 2011, repairs in the central building of the factory are completed. The historic appearance of the building was saved, but the interior space was reorganized. The third novelty of the Swiss company Zenith, presented this autumn, is a Captain Tourbillon watch, replenished the Academy collection. Swiss watch company Zenith has introduced a second model Academy Christophe Colomb Tribute to Charles Fleck, replenished the known Academy collection. The Swiss watchmaker Zenith has introduced its next novelty Academy Minute Repeater (Ref. 27.17.0003.940), improved with so elegant complication as the minute repeater. September 17, 2012 Swiss watch brand Zenith officially presented its new collection of Pilot. The presentation was held at the Museum of Arts and Crafts in Paris. The company Zenith has announced a new women's watch Star Moonphase with the function of the moon phase’s display. The novelty combines the age-old tradition of Swiss watch industry and the incomparable classic style. The company Zenith, known for its specific products, presents its latest product - the wristwatch Zenith Pilot Big Date Special ref 03.2410.4010/21.C722. The 42-mm case of the novelty is made of stainless steel and has a double sapphire crystal. Water resistance of the model is 50 meters. The ambassador of Zenith - Felix Baumgartner in the summer of 2012 is planning to make the jump from a height of 36,576 feet, at first break the sound barrier without a special aircraft, thus placing the altitude record for manned balloon, altitude record, and the duration of free fall. The Swiss brand Zenith has introduced a novelty – an original Zenith Christophe Colomb Skeleton watch, the “predecessor" of which was introduced in 2012 specifically produced for the London boutique Marcus. Swiss watchmaker Zenith has announced the release of new models in a series of Zenith Star, which is a clear example to strictly observe the watch traditions combined with a bold contemporary design. The famous phrase of Leon Moran, the world's first pilot, who in 1910 managed to reach speeds over 100 km / h: "Zenith! Does not the name of this brand suit perfectly for aviators? This is technically perfect tool to measure time in a very attractive case - that's what the watch Zenith”- ever has written this company Zenith in world aviation history. Renowned Swiss watchmaker Zenith at the world exhibition BaselWorld 2012 has introduced a novelty from the exciting watch line of El Primero Chronomaster Open. Swiss watch company Zenith at the world exhibition BaselWorld 2012 has introduced a new exciting watch El Primero Chronomaster Open Grande Date Moon & Sunphase. The novelty is made in two versions - in the case of pink gold and stainless steel. Zenith - one of the oldest watch companies. Created by this brand watches are gorgeous both in its great design and mechanisms. One of these models is the new chronograph El Primero Chronomaster 1969, presented at the world exhibition BaselWorld 2012. At the annual exhibition of BaselWorld 2012 the famous watch company Zenith will introduce its novelty - the pilot's watch Pilot Montre d'Aeronef Type 20. Swiss watch manufacture Zenith has surprised its fans and pilots for its exclusive watches. Swiss company Zenith will present at the upcoming international exhibition BaselWorld 2012 a new Espada watch, in design creating of which the masters are strictly adhered to the canons of traditional classics, bringing into it the elements of vintage style. At the international watch exhibition SIHH 2012 Juliette North - Director of International Marketing and Communications of the company Zenith - stated: "In this segment we have everything you could want. Unique Zenith watch masterpieces, each of which represents a milestone in the stormy history of the brand, are now exhibited in the Qatari capital of Doha in the showroom Blue Salon. All the presented 18 models are permanent exhibits of the Zenith museum, based in Switzerland. In December 19 the Zenith watch company has opened a new mono-brand boutique in Geneva, Rue de Rhone 35. The commercial space of a new watch store is designed in accordance with the concept used for the boutique Zenith, based in Hong Kong. The watch company Zenith has been awarded the Geneva Grand Prix 2011 in nomination "The best complicated watch." The jury has recognized Zenith Christophe Colomb Equation du Temps as the best. This watch represent a triumph over gravity, excellent visualization of the rotating globe and a high movement. The watch company Zenith has introduced its watches in a new light: as an ideal instrument of measuring time for writers, journalists, artists and other creative people who have dedicated their lives to finding answers to questions about the laws of life. Autumn of 2011 is marked by the birth of a new chronograph Captain Winsor Annual Calendar Chronograph, expanded the line of wrist watches Captain, which is produced by the famous Swiss brand Zenith. The novelty is made in an elegant style of traditional classics.